Ordinary Day is one half of a surreal landscape, as I like to call it. There is nothing obviously twisted in either painting, nothing that stands out beyond the colors being enhanced and the drama of the lighting being played up. However, each of these paintings works together to create a surreal day. The landscape continues from one canvas onto the other to create one panoramic image. No matter if Night was placed on the left or if Day was placed on the left, the scene would continue near seamlessly from one canvas to the other. The intent is to represent the repeating cycle of day and night, a full day of the surreal. The landscape represented is one from my imagination but which i have often thought was real and simply a place I haven’t yet traveled. This painting is acrylic on canvas and measures 40″ by 30″. Ordinary Night is one half of a surreal landscape, as I like to call it. There is nothing obviously twisted in either painting, nothing that stands out beyond the colors being enhanced and the drama of the lighting being played up. However, each of these paintings works together to create a surreal day. The landscape continues from one canvas onto the other to create one panoramic image. No matter if Night was placed on the left or if Day was placed on the left, the scene would continue near seamlessly from one canvas to the other. The intent is to represent the repeating cycle of day and night, a full day of the surreal. The landscape represented is one from my imagination but which i have often thought was real and simply a place I haven’t yet traveled. This is another image meant to be seen almost as an illustration into the surreal. 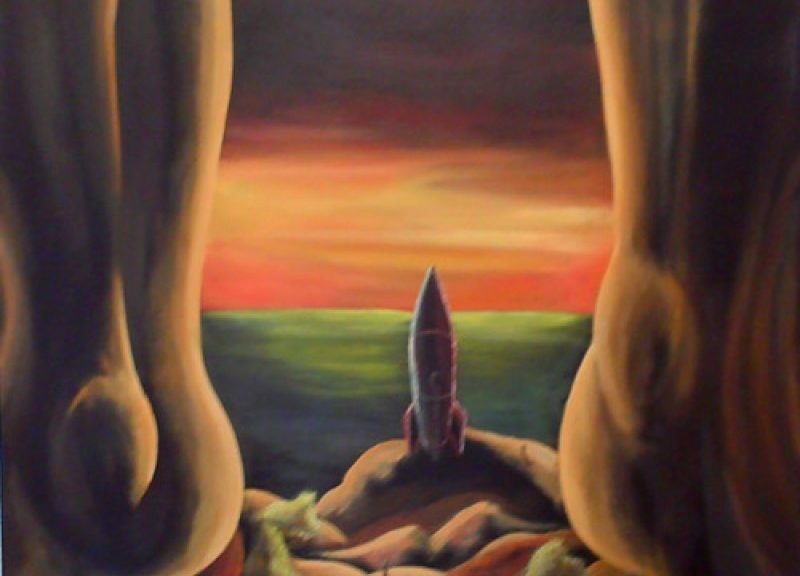 There is a touch of technology thrown in with the intentionally old style rocket ship in the very center of the canvas. Much harder to see but there nonetheless are two tiny explorers, having ventured out from this ship. What might at first seem to be cliffs on either side are actually feet and so the question would be, which one are we? Are we the explorers using technology to venture out, or are we the creatures overlooking what is often right beneath our own feet? There is a nature contrasted with the non-natural world also at play in this painting. 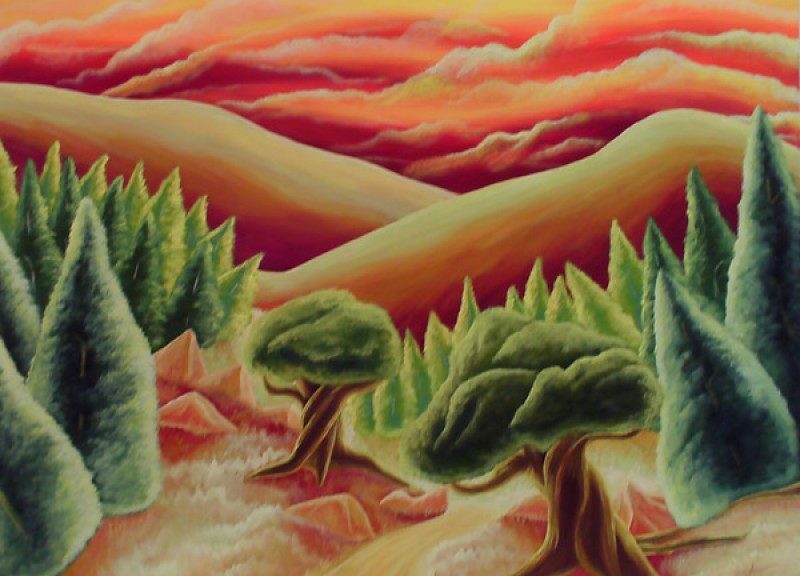 This painting is acrylic on canvas and measures 26″ by 26″. Production was another dreamlike image, meant to encourage thought and contemplation. The general thought behind it was that the surreal is all around us naturally everyday. We only have to look for it. It is a natural part of the world that is grown in life no differently than a forest grows. Colors are important in this image to separate it a bit from the average, playing up contrast and drama. This painting is acrylic on canvas and measures 16″ by 16″. Probably the smallest oil painting I have completed to date, Sign of Life was intended to be a surreal spin on the idea of discovering life or the importance of living things to us. In the image a very tiny shadowy figure is seen standing beneath and looking up at a tremendous tree. The colors in the air behind the tree are intentionally contrasting to draw up the drama of the scene, the almost tense nature of the image. The fact that the tree stands on the very edge of a canyon whose depth we can’t tell is related to the delicate nature of life in general. This painting is oil on canvas and measures 11″ by 14″. ReCreation is just that, a re-imagining of the original Creation painting. I intentionally made the opposite top corner the bright spot to show that this is in ways a reversal of the same elements found in the larger oil painting. I added more vivid and fresh colors to show a new idea, a new thought, and a new feeling to something that isn’t necessarily new. 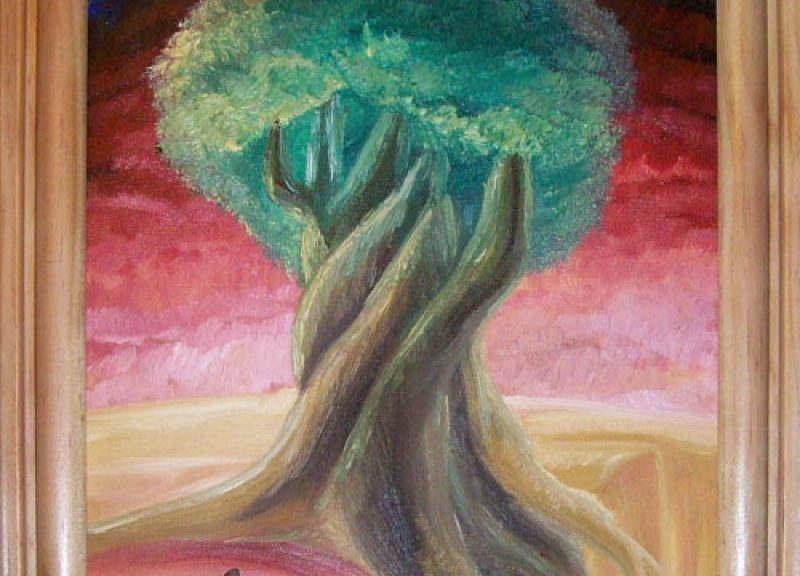 In my mind the idea of taking something done before and turning it or twisting just so to create something new, to recreate the world around us, is the theme behind this painting. 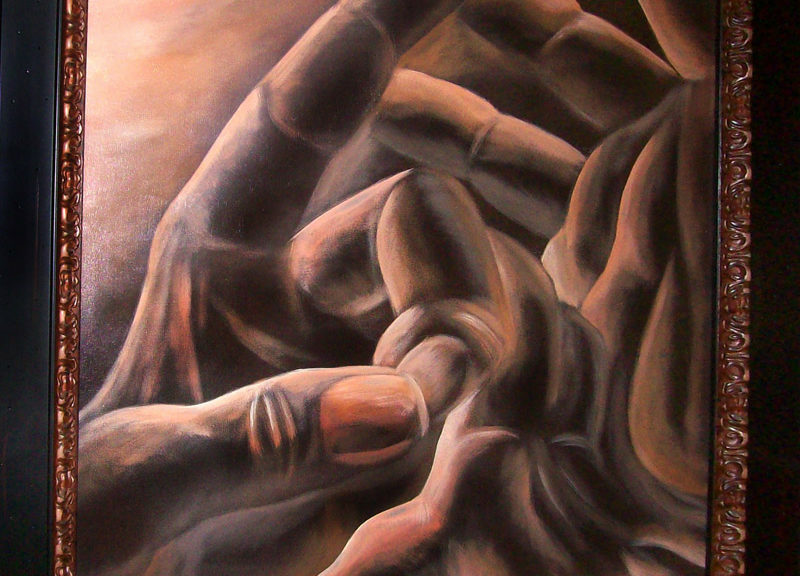 This painting is acrylic on canvas and measures 24″ by 26″. I have been drawing from the age of 2. 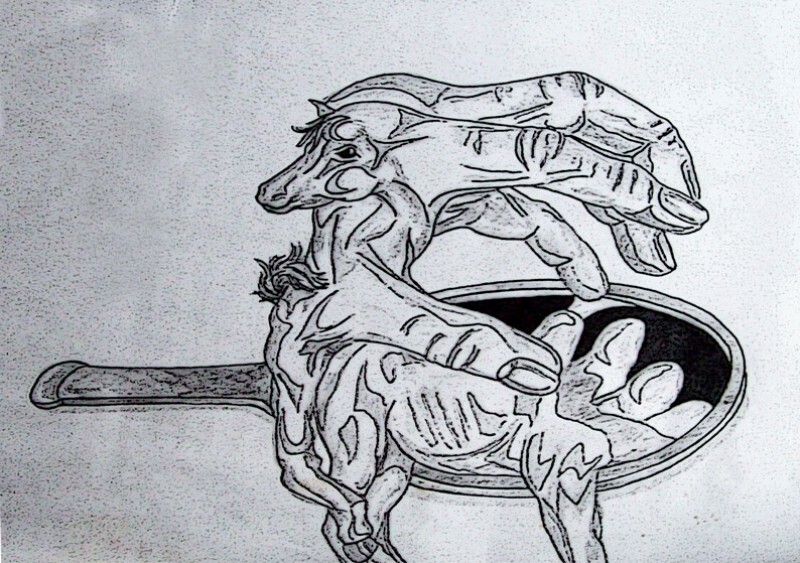 However my surreal side may not have really manifested itself until high school which is when this pen and ink drawing was completed. It was not done to be kept and so is not in the best shape after the years. The idea behind it, so far as I can remember was to show musculature of animals, in this case a horse, and naturally I took that idea or theme and twisted it a bit, oddly enough using a hand of the artist, a theme I wouldn’t repeat for a number of years after this until completing the large oil painting Creation. In the scene is meant to be a hand mirror, laying flat with the hand above reflected. However the images are merged and mashed together with that of a horse to create a surreal mesh of the world and living things. This is one image I might one day work into a painting as it represents a beginning in a way, or the precursor to a beginning. Additionally, I have numerous other surreal pen and ink drawings and many with color added that have been done more recently. Often when plotting a painting, I take this approach to better see in small scale what might work when put on canvas. This is pen, pencil, and ink, and measures approx. 8″ by 7″. Completed some years after the painting Creation, Destruction was meant to be a polar opposite in many ways, a companion piece. The dynamic colors and contrast as well as the seeming motion of the fingers and hands was intended to mimic a wave about to crash. In a manner of speaking it is a wave of destruction caught in motion. 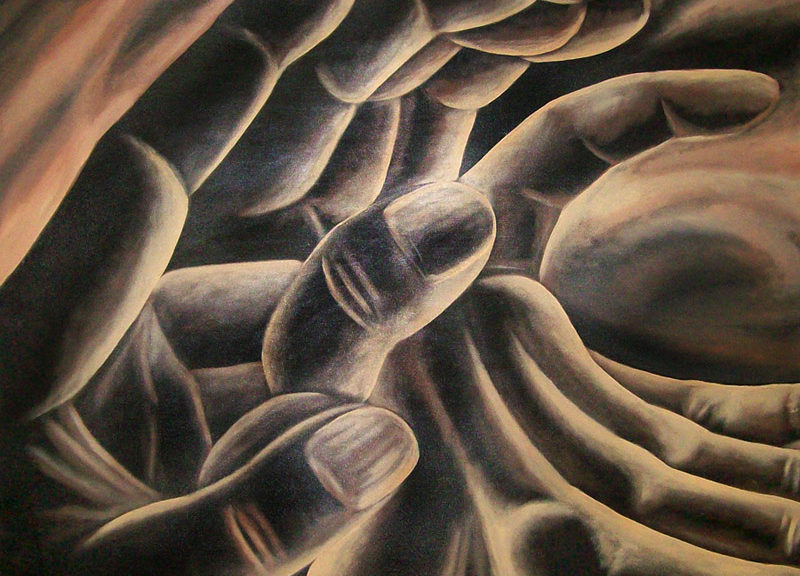 This painting is acrylic, in keeping with the opposite nature of it and Creation, and measures 36″ by 36″. 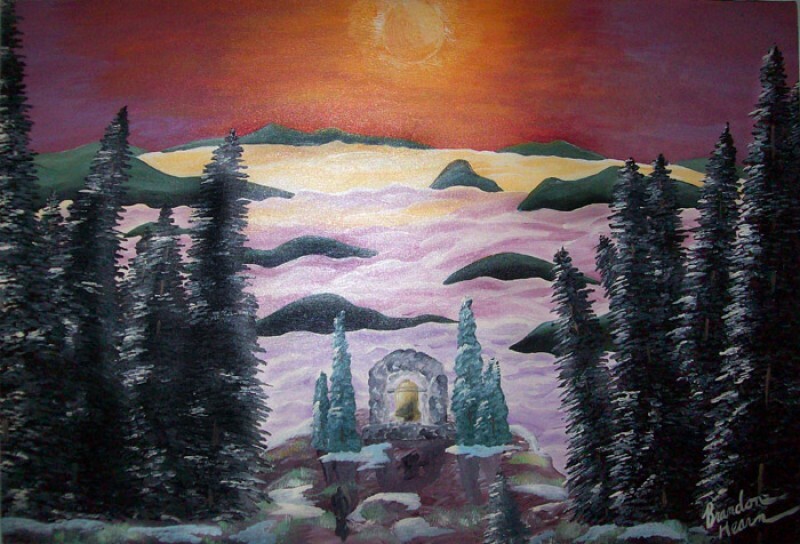 This painting, one of my earliest canvas works, is an example of the landscape paintings and themes I grew out of. Bell of the Blueridge was intended to look a bit out of the ordinary with an image showing amorphous mountains peaking above thick brightly colored clouds. The bell and the dark silhouette of possibly an inhuman figure standing in the foreground was all imagined and represented on the canvas to create questions. I intended the viewer to perhaps create their own scene as they saw this, to use a bit of themselves to make the painting come alive to them personally. The use of vivid color and contrast is something even in the earlier works that shows up here. 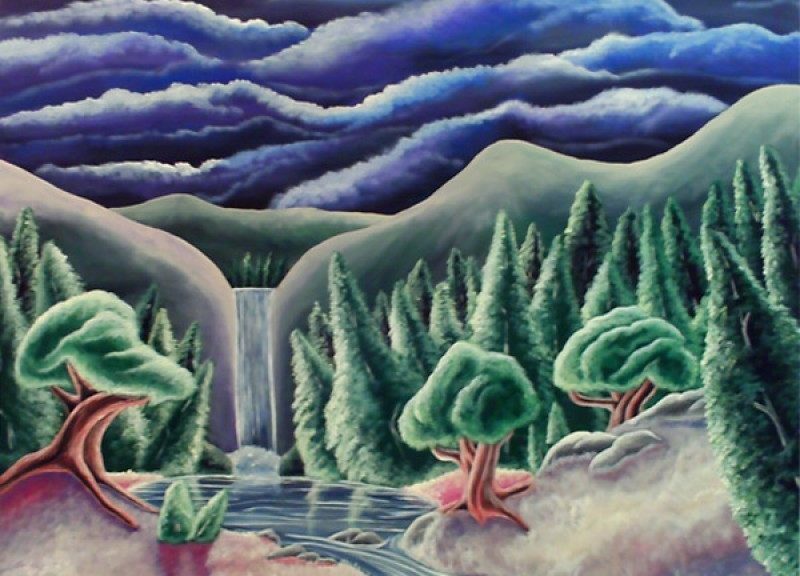 This painting is acrylic on canvas and measures 36″ by 24″. Not all of my art has always been painting or even pen and ink or sketching. 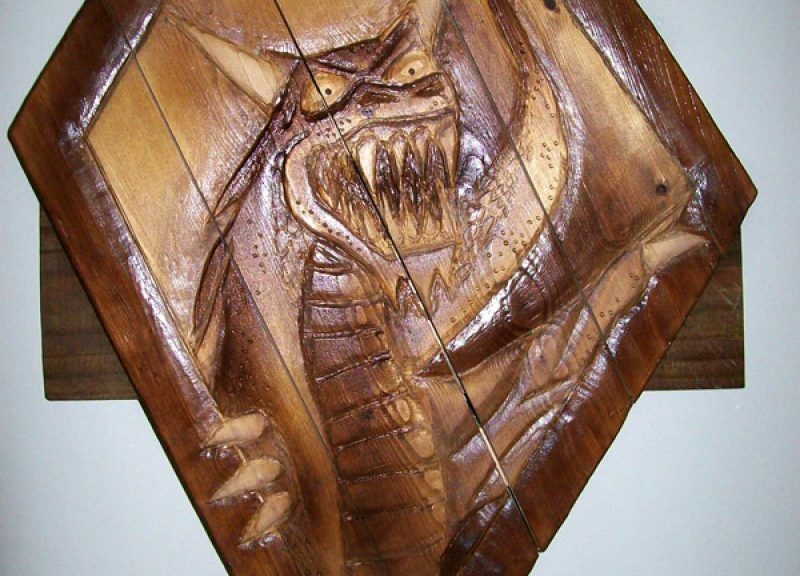 This is an example of carving, a wooden shield made from found scraps of wood which were first sanded, screwed together and cut into shape, and finally hand carved with the image seen emerging from the frame of the shield itself. The wooden shield is a functional piece of art as it does have full leather strap for holding and is quite sturdy and strong. Even in this I tried to keep a surreal mindset, making the image just enough out of the expected so as to draw a second glance. And with the painting Sir Realist showing the sword, I naturally thought a shield was in order. This shield is carved from wood and measures approx. 18″ by 25″. Surrealism is grown in the fields. Nature’s perfect killing machine meets one of mankind’s deadliest mechanisms. Standing alone and yet filling the sky. Traveling the road of life. An early beginning with surreal touches. Merging man and machine to deceive ourselves. Rising above and becoming something new. A literal wave of destructive force. In the course of doing something else. Pure surreal, pure Sir Realist. The end times are surreal. A surreal and yet ordinary scene, both day and night, connected. We all search for meaning and where we belong. Seeking to meet but separated forever. Reducing complexity to a simpler form. Holding the fate of the planet in the palm of our hands. Creation made new and with a fresh perspective. A self portrait in surrealism. A surreal respite from the desert of life. Traveling into the great unknown. The miracle of human thinking. Three paintings creating one mythical image. 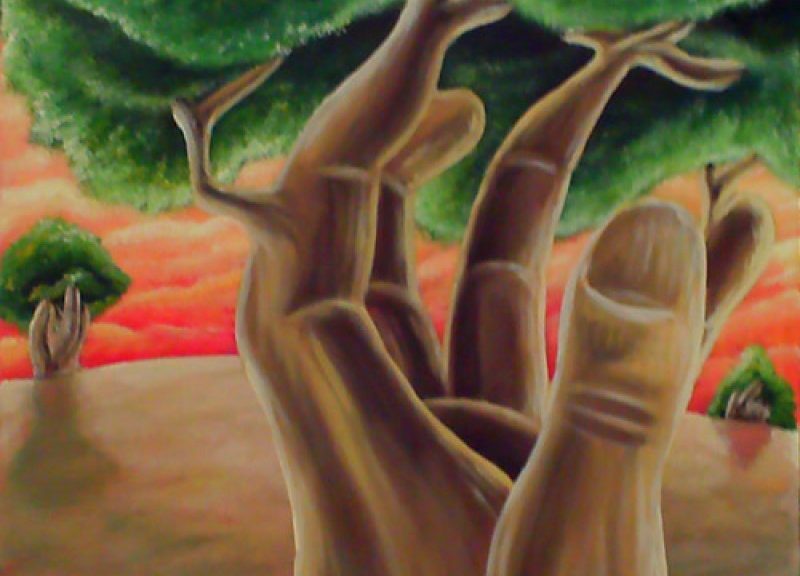 Perhaps the very first surreal art I completed. Are we the unseen giants or the explorers. The merging of two living things in an intrusive and nightmarish surreality.